We had a visit from a couple we know who are moving forward in a Female Led Relationship. She has long since completely taken over management of the finances and thus has a solid grip on power. We'd think that a man who has given financial control to his wife would fall into line on housework, but he hasn't. 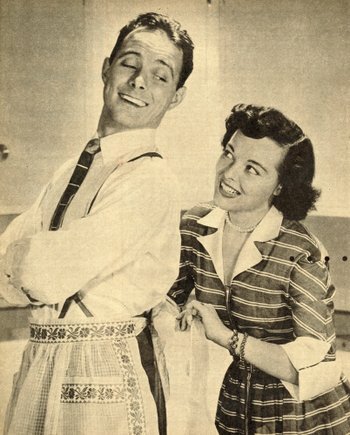 Men should be doing housework because it relieves her of some or all of the routine and drudgery allowing her to pursue personal interests, a career or just relaxation. It's all about female empowerment. Mowing the grass, changing oil and the like aren't the type of thing that she would be doing, so she gets no benefit. Guy-jobs of the type mentioned are infrequent compared to the ongoing nature of housework. “A woman's work is never done” is a saying steeped in reality. In many cases guy-jobs are more hobbies than actual work, excuses to run off for endless hours at the auto parts or hardware store. And they are inefficient tasks, too. For example, one can have their oil changed for less money and way less time than doing it oneself. Mowing the lawn is also a task that can be outsourced, freeing him to be available for more work inside where his efforts will directly benefit her. And for home repairs it’s much better to hire a pro. Things get done more quickly and don't cause a husband to lose focus on what his wife wants. 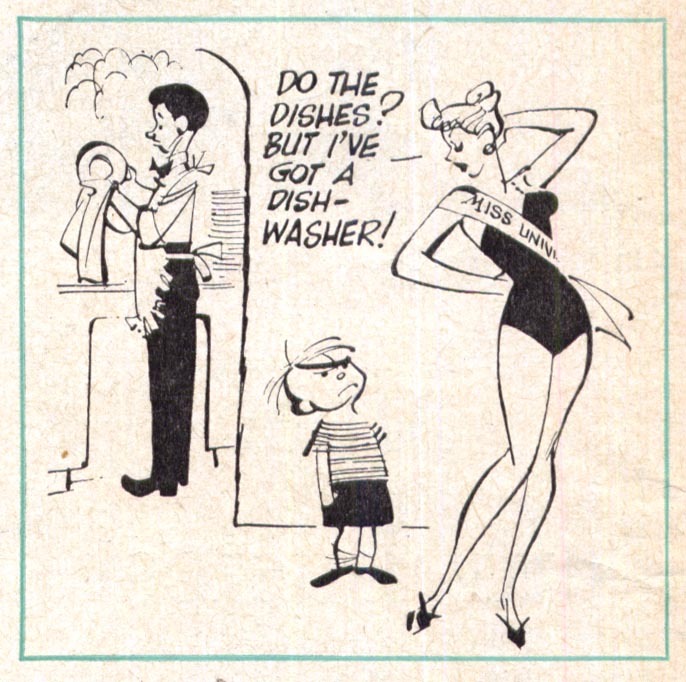 Housework keeps men productively occupied, something he would unlikely be if left to his own devices. And doing housework makes men appreciate just how difficult it is to keep a home neat, orderly and running efficiently. In addition to the benefit it provides her, men doing traditional housework also benefits them. 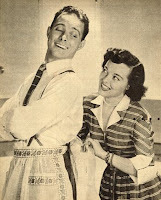 Our experience is that housework changes men’s perspectives and gives them a sense of satisfaction and accomplishment. Men may be hesitant about housework but once they understand what she wants, how she wants it done and establish a routine to do it, it will be very satisfying to him and empowering to her. A woman need to be involved and establish a routine for her man. Additionally, since men are not well versed in household tasks, she'll likely have to spell things out and do some training and exercise oversight, but her persistence will pay off. In our case, I have a housework routine that includes cleaning, washing and ironing. 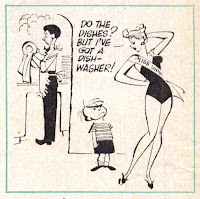 Since Nancy and her mother enjoy cooking, I infrequently cook, but I do serve meals and clean up afterward. Over the years I have taken on more and more domestic duties and am always looking to do more work and more in terms of looking after Nancy and her mother. Wanting to do more is a common feeling that many men have after settling into an FLR. I was doing so much inside that, at Nancy's direction, I abandoned the inefficient chores I was doing outside and in the garage, freeing up time for more inside tasks and interests. We're all much happier as a result. My partner bought me a pinny apron online last week, looks like the rules have changed in this house at least. My wife dislikes most domestic work, other than cooking or baking (provided someone cleans up afterward). On the other hand, I enjoy tidying up and so it has become an easy match that way! I struggle with idea of becoming a full time homemaker (I work restricted hours now). I think she wouldn't mind as long as I am happy doing it, and we'll just have to see with her career, which has taken off in the past few years. Devoted Hubby, Thank you for your comments. Your situation is similar to the one I have with my wife and her mother. Nancy and Sue like to cook and so do most of our meal preparation. Once prepared though, it's mine to serve and to clean up after. It works well for all of us. As for other domestic work, that is my area of responsibility and I enjoy doing these tasks, although the women do not. I have an ongoing regimen of housework, doing a little each day. It's enjoyable and gives me a feeling of accomplishment. I've also thought about becoming a full-time homemaker but Nancy likes the to have the money I earn coming in. Perhaps as her career advances further, she'll allow me to be a full-time homemaker but until then I can only dream. (Devoted Hubby here). I find it has increased her confidence at home, knowing that I want to take up the slack so that she can focus on more important things (she is a terrific organizer). She is also a very messy person, and where that used to drive me crazy, I love tidying up after her. I don't know if she consciously continues to leave her work clothes lying around for me to put away, but I like it!